Our organization holds expertise in offering a comprehensive range of Insole Ribbons that are available in elegant finish, vibrant colors, various sizes, designs and patterns and can be customized as per client’s request. 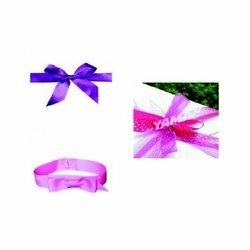 Our ranges of these ribbons are fabricated using finest raw material. These ribbons are used to decorate the gift items. Owing to their availability of colors and designs they are highly demanded in the market. These are available in various widths and lengths. Looking for “Insole & Satin Ribbons”?